The Turtle Creek Neighborhood in South Carolina is located just off of Clemson Road and Two Notch Road on the northeast side of Columbia. Located between the Clemson University Sandhill Station and the Summit neighborhood, this community is just 15 minutes from all the enjoyment of downtown Columbia, SC. And Turtle Creek is just a 10 minute drive to I-77 and I-20, and 20 minutes from I-26, placing residents on the road to anywhere in the State or the Southeast. In little more than an hour, residents can find themselves in Charlotte, North Carolina and in less than three hours, at the beach or in the mountains. 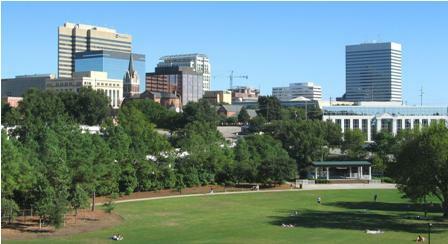 Head west and find Atlanta, Georgia less than 5 hours away from the community. Living in Turtle Creek provides easy access to work and fun, near or far, wherever it is you wish to go. Turtle Creek is a neighborhood where you can find brick ranch style homes with mature trees and the homes outlined by sidewalks. Homes here range in value from $115,000.00 to over $165,000.00 with some being adjacent to the quiet, natural setting of the Clemson University property and some bordered by a creek. These homes range in size from 1500 square feet to almost 2000 square feet with some including bonus rooms. Other amenities include large, private yards; cathedral ceilings; French doors; garden tubs, fireplaces, and sprinkler systems. Whatever your desire, the Turtle Creek neighborhood has a variety of options from which to choose in a nice, quaint, setting. One of the greatest benefits of living in the Turtle Creek neighborhood is that residents have access to the trails and natural setting of the Clemson University Sandhill Research and Education Center which also includes a Children’s Garden, hosts a weekly farmers market during the growing season, and holds an annual festival. Across Clemson Road from the Clemson University property is the well-known Villages at Sandhill with its vast variety of shopping and dining experiences, as well as frequent weekend entertainment. There are several golf courses just a 5 minute drive from the Turtle Creek neighborhood, as well as Sesquicentennial State Park which provides access to several more trails as well as picnic areas and camping opportunities. Downtown Columbia, SC is just 15 minutes away providing more options from which to choose for restaurants and shopping as well as theaters, museums, and outdoor activities to include the nationally renowned Riverbanks Zoo and Botanical Gardens. Whatever it is that you enjoy doing, the Turtle Creek Neighborhood puts you close to just about anything.